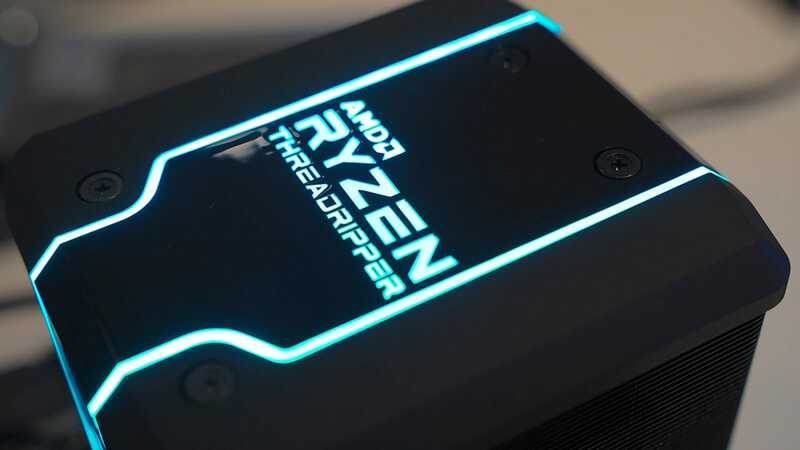 I won’t lie, when AMD’s new 16-core monster CPU, the Ryzen Threadripper 2950X, arrived, I ran around the office showing off it and its accompanying air cooler to anyone who would make eye contact with me. The thing is enormous—easily twice as large as a standard desktop CPU from Intel. 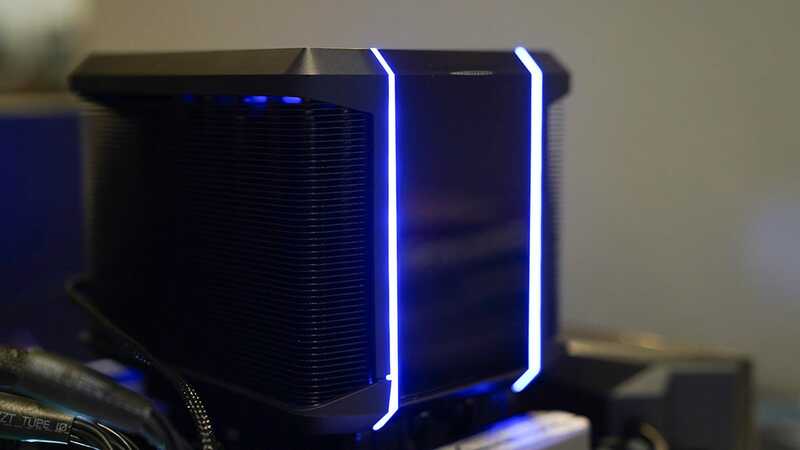 The air cooler, saddled with the goofy name Wraith Ripper and festooned with LED lighting, is larger than most power supplies, and if dropped, it could do damage to floors, feet, and small woodland creatures. Even people who know nothing about computers were suitably impressed by these enormous pieces of PC. Then they’d ask how much the Threadripper 2950X cost. And that’s where I’d lose them. For most people, only two things matter when it comes to considering a processor for a desktop one already owns or for a computer someone else is building. One: How fast is it? Two: How much is it going to cost? 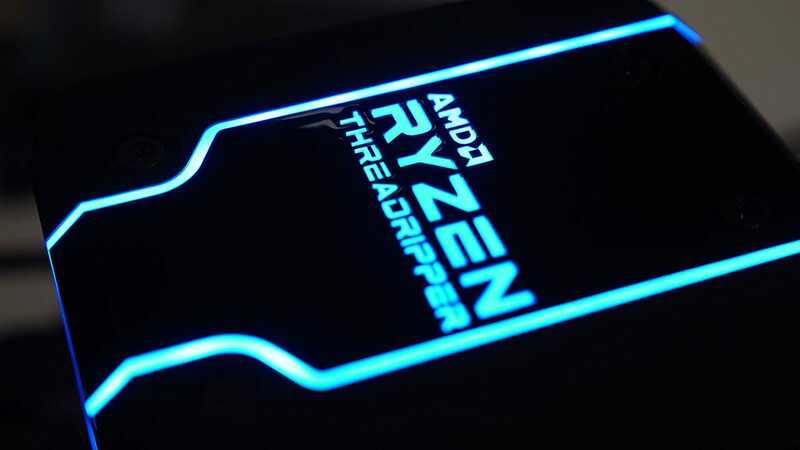 AMD’s answer for the last years has consistently been, “faster than the other guy, and cheaper too.” The new Threadripper 2 is no exception—as long as you consider what it’s up against. With 16 cores and a price tag of $900 (£709; UK pricing TBA), which is less than half the price of its 32-core sibling, the AMD Threadripper 2990WX, the 2950X is a steal. I mean... if you’re in the market for a processing beast with a price tag to match. 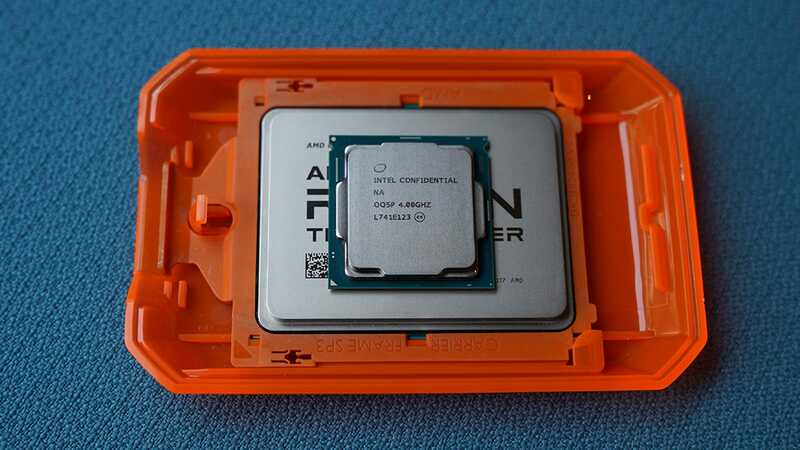 Cheaper CPUs are available from both AMD and Intel, and for all but the most demanding CPU tasks, those processors will be a better option than the $900 Threadripper 2, even if it’s cheaper than Intel’s 16-core offering. To that end I judged its speed compared to the latest 8th-gen desktop processors from Intel, and the newest Ryzen 5 from AMD. CPUs that are all a third to half as expensive as the Threadripper 2. So who is the Threadripper 2 for? The standard customers for something this pricey: professionals and people who like to brag on Reddit. That’s not a slight against these people. Rather, the Threadripper’s big, expensive power boost won’t really help with most applications we all use day-to-day—and it’s not really meant to. Those day-to-day applications aren’t designed with the Threadripper’s primary power boost in mind. That boost is the number of cores at its centre. It has 16. The average multi-core processor—the CPUs that power nearly all computers and phones—has just two to eight cores (I benchmarked it versus three CPUs that each have six cores). Cores are where all the actual processing for your computer happens, and more cores usually means more speed because your computer can split up taxing tasks, thus taking advantage of those cores. “Can” is the operative word here. Not all programs will take advantage of multiple cores. If a browser was optimised for two cores, it won’t necessarily know what to do with 16 and could just chug along furiously taxing those first two cores while leaving the rest idle. Set the cooler on the processor, turn those four screws, and you’re done. This is, without a doubt, the easiest to install cooler I have ever used, and Intel and other divisions of AMD should take note. An Intel i7 CPU just sitting on top of the Threadripper, for scale. 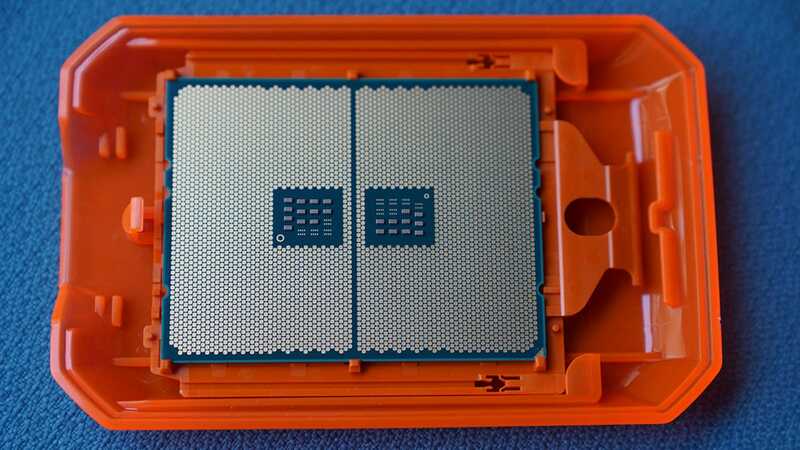 The pin side of the CPU. It’s a lot easier work with than the other Ryzen CPUs. It glows a lot. Also it’s very, very tall and will not fit in many standard PC cases. 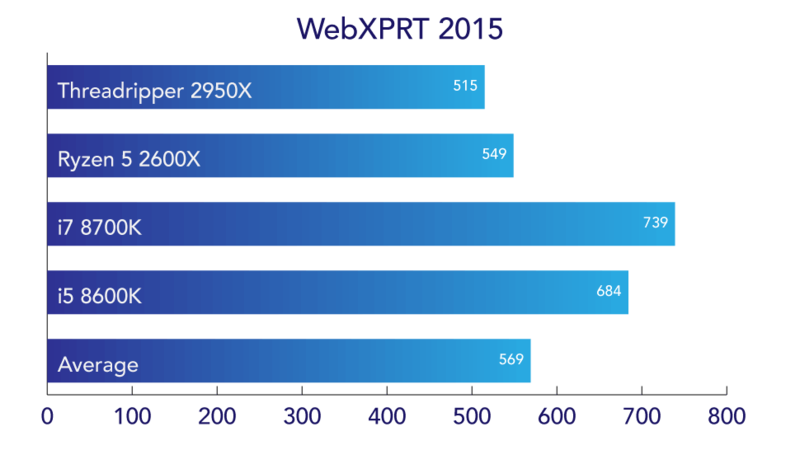 That is almost exactly what we see when running WebXPRT 2015, a synthetic benchmark designed to test how quickly a computer runs through a series of browser-based tasks. The Threadripper 2950X is actually slower than every other processor we tested it against, including a six-core Intel i5 8600K and a six-core Intel i7 8700K. The difference isn’t astronomical (in our experience, any score over 500 will lead to a snappy and pleasant browsing experience), but as you can see from the score below, the AMD chips suffer from a lack of optimisation that the Intel chips have. It also won’t really help you game faster, or do minor CPU-demanding processes like resizing and converting a series of RAW images in Photoshop. 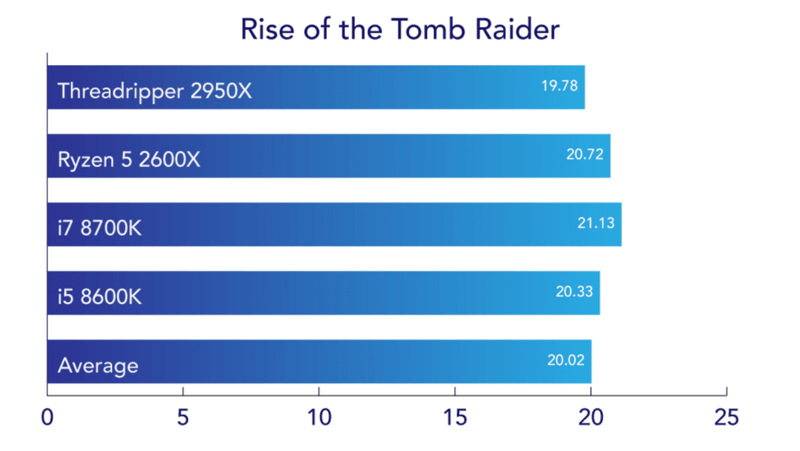 In the benchmark built into the game Rise of the Tomb Raider, all four CPUs we tested were practically neck and neck producing and average 20 frames per second. 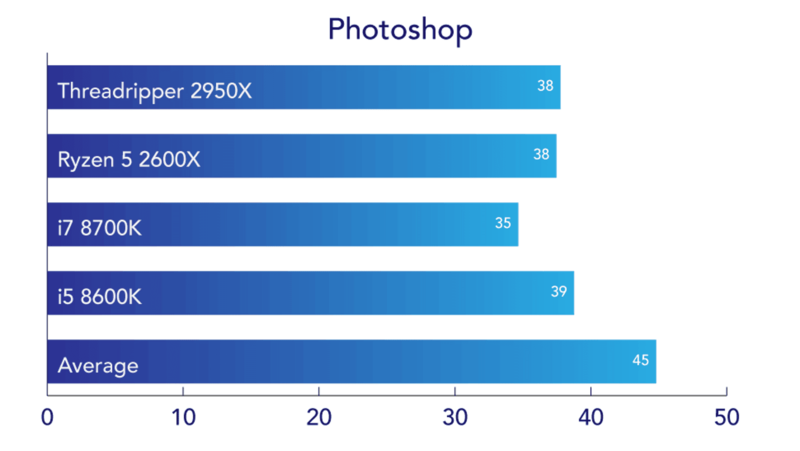 Same for Photoshop, where the speed of your storage matters more than your processor when converting images. The only exception to this rule was in the Civilization VI AI benchmark. 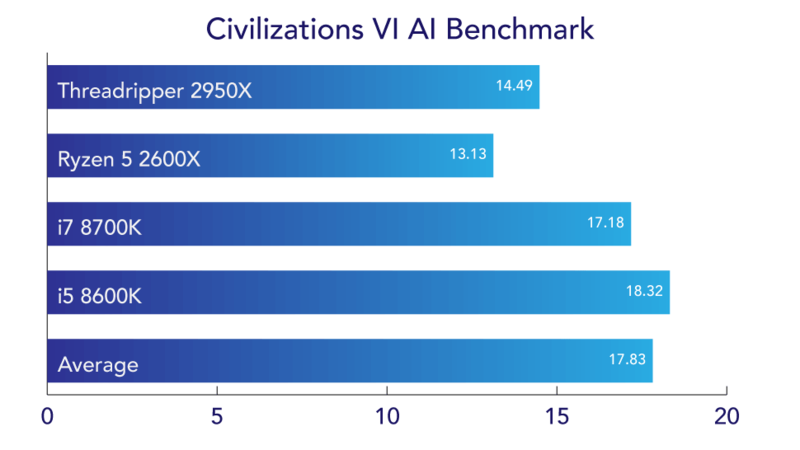 Unlike the graphics benchmark for that game, the AI benchmark is designed to test the CPU of a device, and it does so by seeing how quickly the CPU can process a turn of the game’s artificial intelligence. Faster is better in this case, and the Threadripper 2's 16 cores helped it eke out a victory...at least against Intel. The £175 Ryzen 5 still performed better. Where we really begin to see the actual speed of this CPU is in Geekbench 4. Geekbench is another synthetic benchmark that ascribes a score based on how quickly the computer handles a series of CPU-intensive tasks. 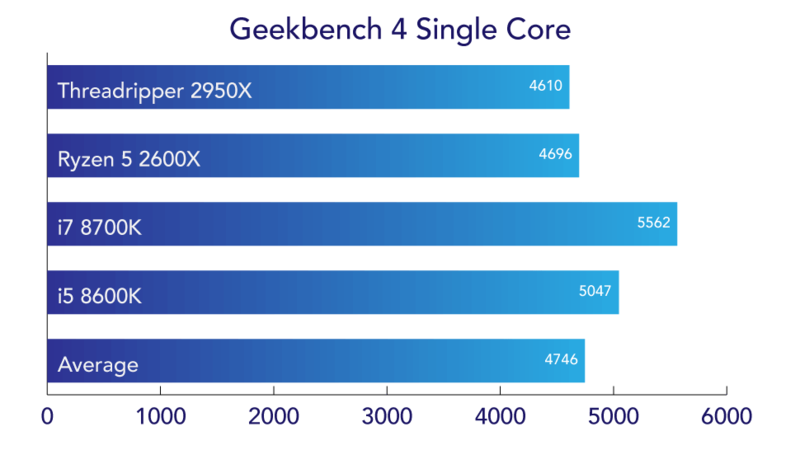 What’s cool about Geekbench is, it gives you a score for a single core of a processor, as well as all the processors scored together, with higher scores generally translating to faster processors. In AMD’s case, its single core scores are... pretty average and another reason why apps like web browsers don’t reap the benefits of AMD’s promised speed. Browsers are designed to be used by only one, maybe two cores, and AMD, on a pure core-by-core basis, simply cannot compete with Intel. 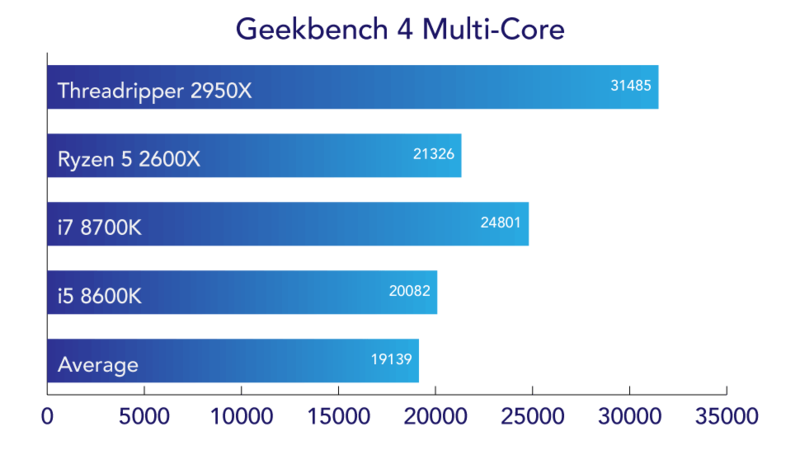 However, let’s look at the multi-core score, where the Threadripper 2950X’s 16 cores go up against the six cores of the AMD Ryzen 5 2600X, Intel i7 8700K, and Intel i5 8600K. It’s dangerously close to having a score twice as high as the i5! 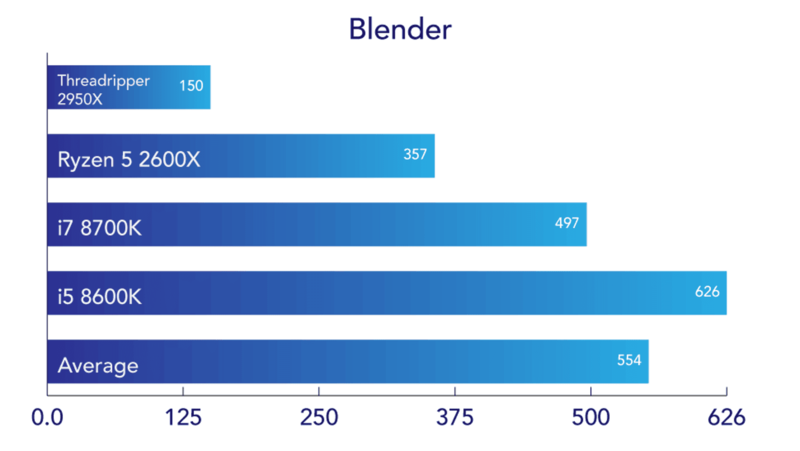 With a score of 31,485, it’s not only leaving all the other CPUs tested in the dust, it’s also screaming well past the average score of every desktop CPU we’ve tested since 2016. Okay. I know what you’re asking—so when do all these cores and all this promised speed actually reveal themselves in a real-world setting? In applications that are actually designed to take advantage of multiple cores. That means applications like Handbrake, Adobe Premiere, Blender, and AutoCAD. These are apps that their makers expect to run not just on the laptops and desktops most of us have at home, but on powerful and expensive servers in offices, academia, and on a Hollywood backlot. They’re greedy for more cores, and when these kinds of applications see those cores, boy howdy, do they take advantage of them. 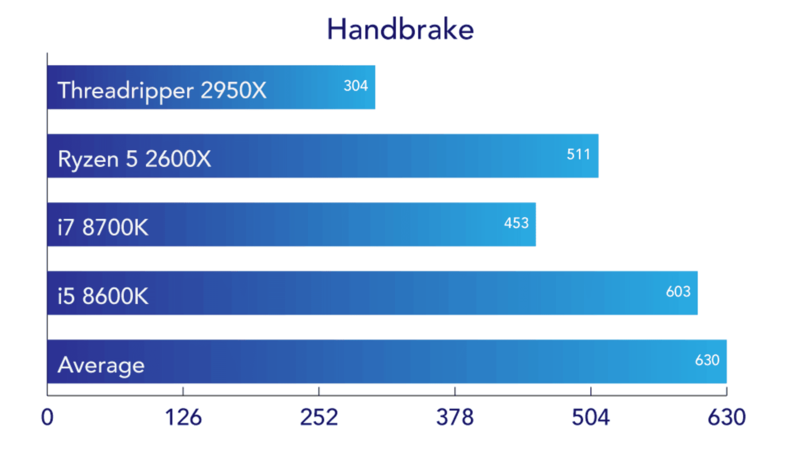 Using Handbrake, we convert a large 4K video file to 1080p. On average, this task takes over ten minutes. The Threadripper 2950X did it in just five minutes. In Blender, it was even more impressive. We timed how long it takes Blender to render a single image from a file. The average time is nearly ten minutes. The Threadripper 2950X did it in two minutes and 30 seconds. It was so fast I had to restart the computer and rerun the benchmark, just to be absolutely positive the number was correct. So, is almost unreal performance in CPU-intensive tasks really worth the asking price of the AMD Ryzen Threadripper 2950X, or its 32-core £1,640 sibling, the 2990WX? Probably not for most people reading this. It’s likely a better buy than Intel’s comparable offering, the 16-core £1,260 Intel i9 7960X. It will absolutely do everything you need super quickly, and it will be no slouch in gaming, web browsing, or other more menial tasks. But the Threadripper isn’t built for you and me. It’s a CPU built for professionals and people with more money than sense on how to spend it.